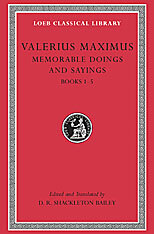 Valerius Maximus compiled his handbook of notable deeds and sayings during the reign of Tiberius (14–37 CE). The collection was very popular in the Renaissance and has recently attracted renewed scholarly attention. Yet to date there has been no modern English translation of Memorable Doings and Sayings. This work is now added to the Loeb Classical Library, a freshly edited Latin text facing D. R. Shackleton Bailey’s pleasing and authoritative translation. 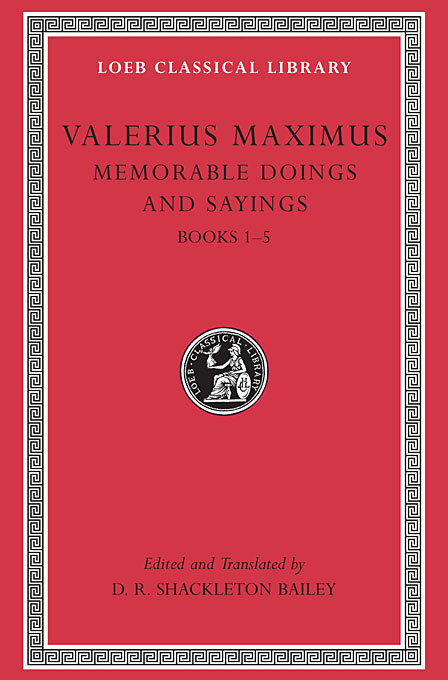 Valerius arranges his instructive examples in short chapters, each focused on a particular virtue, vice, religious practice, or traditional custom—including Omens, Dreams, Anger, Cruelty, Bravery, Fidelity, Gratitude, Friendship, and Parental Love. The moral undercurrent of this collection is readily apparent. But Valerius tells us that the book’s purpose is practical: he decided to select worthwhile material from famous writers so that people looking for illustrative examples might be spared the trouble of research. Whatever the author’s intention, his book is an interesting source of information on Roman attitudes toward religion and moral values in the first century.